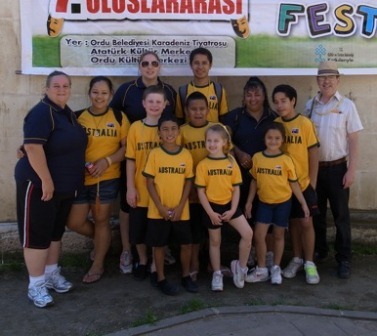 The Factory Community Centre’s YURUNGAI DANCE GROUP have returned triumphant following representing Australia at the 2011 Seventh International Ordu (Turkey) Youth and Children’s Theatre Festival held between June 14–21. The group were generously received in the Black Sea port, famous for it’s connection with the founder of modern Turkey, Kemal Atatürk, and also its hazelnut growing industry. Performing two shows in a central recreational area to large crowds, Yurungai Dance was rapturously received to the extent that security had to be called into the 2nd performance in order to protect the young indigenous group from inner city Sydney. The eight member troupe also performed twice to over 1500 hundred children and the general public in a central park in Ankara, in the presence of Ambassador to Turkey, Mr Ian Biggs and his wife Christine. (See photos below.) The 1st perforamce was streamed live to air on National TV. 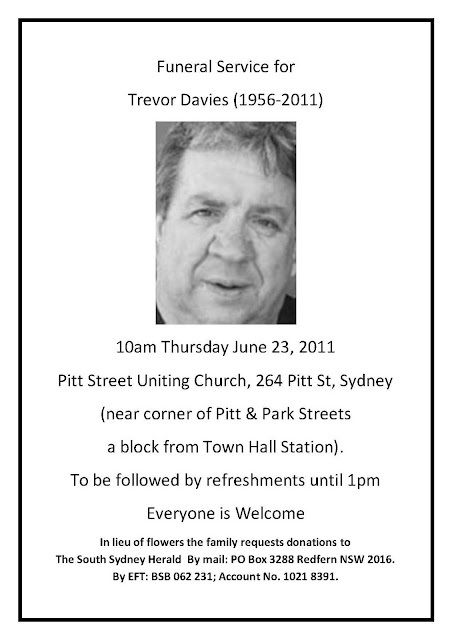 The Funeral Service for Trevor Davies will be held at 10am on Thursday June 23, 2011at Pitt Street Uniting Church, 264 Pitt St, Sydney (near to corner of Pitt& Park Streets and a block from Town Hall Station). The service will be followed by refreshments until 1pm. In lieu of flowers the family requests donations to The South Sydney Herald. By mail: PO Box 3288 Redfern NSW 2016. By EFT: BSB 062 231; Account No. 1021 8391. Trevor was a member and Elder of South Sydney Uniting Church, the founding editor of the South Sydney Herald and long-time Secretary of the Darlington ALP Branch. Trevor was one of the foundation members of REDWatch, had served as a committee member in almost every community organisation in the area at one time or another over the last 30 years. At the time of his death his committee responsibilities included being Vice President of the St Vincent de Paul branch that covered the Redfern area. Trevor had a wide circle of friends from his various involvements and the people he met along the way; be that as a street sweeper, working in the Darlington newsagency, at Politics in the Pub, as part of Redfern Residents for Reconciliation, at political meetings or delivering leaflets for a meeting, or his beloved local newspapers (the South Sydney Herald only being the most recent incarnation). Trevor’s death was sudden although he had not been well for some time. He was due to have an angiogram on the day he died but was taken to hospital the evening before where he had a heart attack and was operated on for several hours before he died on Tuesday 14 June 2011. His death came as a particular shock to those who had spoken to him around the Darlington coffee shops over the long weekend or had talked to him in one of his various activities in the week before. Trevor had only recently celebrated his 55thbirthday and was brother to Susan, Annie and Ivor. Susan has recently started work at the Big Issue office in Redfern. His family would welcome assistance with the funeral costs and if you are able to contribute please contact his sister Susan Leith-Miller on leithsu@bigpond.comand / or make a contribution to Account name: Susan Leith-Miller BSB: 062 231 Account Number: 1037 0246. Any surplus funds will be donated to the South Sydney Herald. The South Sydney Herald will publish tributes to Trevor in their July issue. You can email your story or message to editor@ssh.com.au before the weekend. Trevor played an important role in the South Sydney Herald and they are currently looking at how they rearrange responsibilities to cover a Trevor sized hole. If you have skills that may be of assistance to the paper, even in the short term, please contact Andrew at editor@ssh.com.au. It has also been suggested by Gai Smith, who is helping with other family archives to be deposited with the Mitchell library, that the Mitchell Library would also be interested in receiving people’s stories. She says “it's very important to use the occasion of the great gathering of people who come to honour Trevor on Thursday to get people to commit to contributing their memories of Trevor, and what they know of all he did in their area of interest, in writing - so we can gather the materials that will be needed to document the life of a great man. We'll never get that chance again, to have in oneplace so many people who knew the different facets of Trevor's life”. We encourage you to put something in writing about your interactions with Trevor and add items to SMH Tribute Page for Trevor or pass these on to the South Sydney Herald to either publish or to pass on to an archive. City News’ Redfern mourns the death of community activist – Trevor is on the front page of a paper other than SSH! It has also been suggested that there should be some permanent memorial for Trevor in Darlington. With Council due to do some work around the Darlington shops within the next 12 months people might like to consider how Trevor could be best remembered by his community? If there is a good idea and it gains support then we are sure it can be made to happen like many of Trevor’s own good ideas! Trevor will be missed greatly by the community that he served and stirred for so many years. Farewell political comrade, church brother and personal friend. An important new coalition has been formed in Redfern and Waterloo called Groundswell.“Groundswell is an avenue for the Redfern/Waterloo community to make informed decisions and to ensure their voices are heard during the Built Environment and Master planning processes. Groundswell aims to provide resources and mechanisms for organisations and residents to achieve this goal. Groundswell celebrates our community and its diversity in a spirit of mutual respect, openness and good humour” says the coalition’s mission statement on its new website at www.groundswellcoalition.org.au. Groundswell has been initially formed by the following non-government organisations: The Factory Community Centre; Inner Sydney Regional Council for Social Development; Our House Swap; REDWatch; Redfern Legal Centre; South Sydney Community Aid Multicultural Neighbourhood Centre; Sydney University Settlement Neighbourhood Centre; University of NSW Community Development Project; and the UWS Residents’ Voices Project. Groundswell hopes that other agencies and people of goodwill will join with them in supporting local residents. More information on how agency workers can help can be found in Groundswell Introduction - Information for Agencies (231KB PDF). While Groundswell does not include government agencies, the Groundswell Coalition is keen to see government agencies adequately resource residents to understand what the government has proposed so residents are able to respond to these proposals. To this end Groundswell welcomes the RWA & SMDA registering interest in working with Groundswell. Groundswell is also hoping that Housing NSW will be able to agree its community engagement framework with Groundswell agencies for the Housing NSW Master Plan Community Engagement strategy including adequately resourcing independent support for residents. The initial focus for the Groundswell Coalition is to encourage the community to start thinking about what is proposed and its implications for the area. 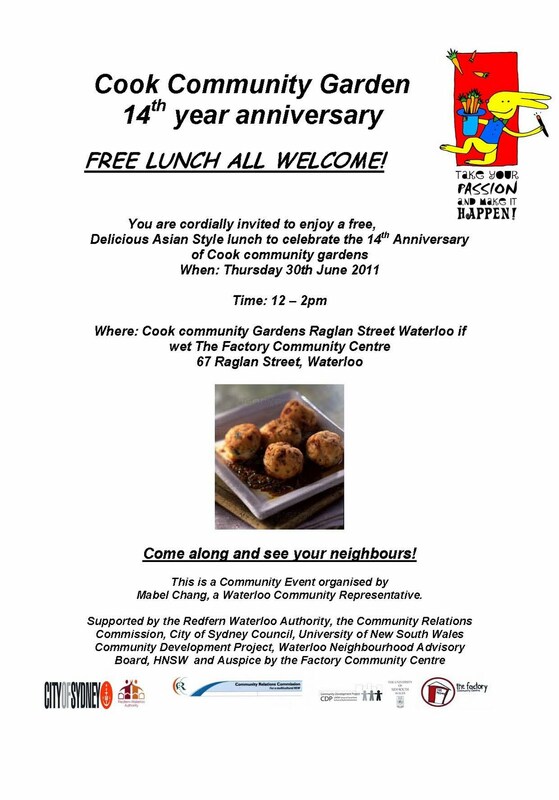 An initial Join Groundswell in Redfern and Waterloo (320KB PDF) flyer is also available in Chinese, Indonesian, Russian and Vietnamese from the Documentation section of the Groundswell website. Supporting agencies and residents are encouraged to undertake activities which will encourage discussion and engagement. 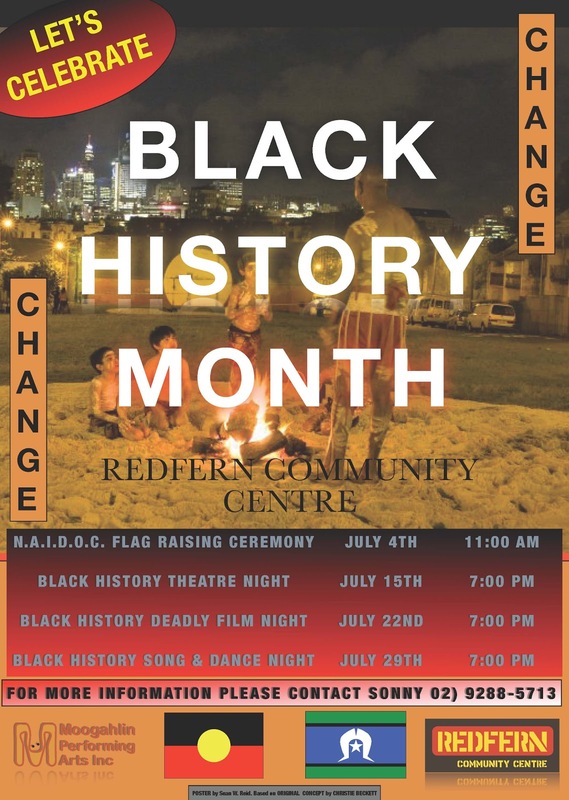 Among the activities being undertaken are stalls at Redfern Markets and other locations (including the Shelter NSW conference), surveys,film showings and information & skills sessions. Twenty DVDs of the recently released Saving Erko Estate have been obtained and with discussion starter questions are being lent out around public housing tenants. This will be followed by activities that bring people together where they can explore how they might want to respond to what is proposed. It is likely there will be a variety of responses. Groundswell is not just for public tenants; Groundswell aims to work with both public and private residents and to encourage them to work together in responding to the issues which will affect all sections of the community. Groundswell also is looking for support from people who are prepared to volunteer their expertise to work with the community – this might include people with expertise in architecture, planning, facilitation, community engagement, community education etc. Coalition meetings to date have included both public and private residents as well as agencies. If you are able to assist in anyway email info@groundswellcoalition.org.auor make a post on the forum section of the Groundswell website. You can also follow GroundSwell on facebook - we hope you like it! You can see media coverage of the formation of Groundswell in the South Sydney Herald’s Groundswell of support for housing tenants and City News’ Groundswell coming to Redfern and Waterloo. The Hon. Brad Hazzard, Minister for Planning and Infrastructure, was welcomed to Redfern on Friday, 10 June 2011 for an extensive tour to showcase what this vibrant area has to offer. The Minister met with Redfern-Waterloo Authority’s CEO Roy Wakelin-King and members of the community with visits to many of the positive developments in the area including the National Centre of Indigenous Excellence, Australian Technology Park, Redfern Community Health Centre, The Block and Redfern Oval, finishing with a tour of the Les Tobler Construction Centre and lunch at Yaama Dhiyaan. Redfern Fire Station has been given a colourful facelift with the unveiling of a new fire safety mural to educate the public about fire safety. Over 160 school students from across Australia entered the competition as part of a campaign aimed at reducing Aboriginal deaths and injuries from fires at home. Four winning designs were chosen. Donovan in Year 8 from Fairfield Patrician Brothers School based his design on the fire safety message: “Everyone should have an escape plan.” Byron in Year 5 from Lambton Public School and Abbey from West Wallsend expressed the importance of not playing with matches, and Imogen in Year 4 from Lambton Public School, used the phrase ‘Stop, drop, and roll’ to put out a fire in her work. Many community members came together for the launch with a didgeridoo and band performance, a welcome to country by Charles Madden, speeches, a video of the making of the mural, a smoking ceremony and a lunch. Steve Russell, Aboriginal Services Officer, said the main aim of the campaign is to raise awareness of fire safety in the community with the mural “brightening up the neighbourhood”. Redfern Fire Station is the fourth busiest station in NSW. 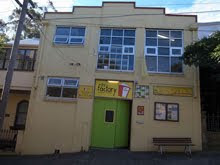 107 Redfern St, Redfern is set to be the new home for three local organisations as part of City Of Sydney’s Accommodation Grants Program. The program supports non-profit, locally based organisations by giving them a new home in City-owned buildings at nil or below market rent. · Tribal Warrior’s Mentor Program to run its mentoring program for Aboriginal and Torres Islander youth. Waterloo will also be the home to the Asylum Seekers Centre for NSW who has received an accommodation grant to occupy the Waterloo Town Hall Office. It was with great sadness that the local inner city community received the news of Trevor Davies’ sudden passing last week. Trevor was a member and Elder of South Sydney Uniting Church, the founding editor of the South Sydney Herald and long-time Secretary of the Darlington ALP Branch. Trevor was one of the foundation members of REDWatch and was known to very many people within the local community. Trevor had only just celebrated his 55th birthday. A Funeral Service for Trevor Davies is to be held on Thursday, June 23 at 10:00am at the Pitt Street Uniting Church, 264 Pitt St, Sydney. In lieu of flowers, the family has requested donations be made to South Sydney Herald - BSB 062 231; Account No. 1021 8391. 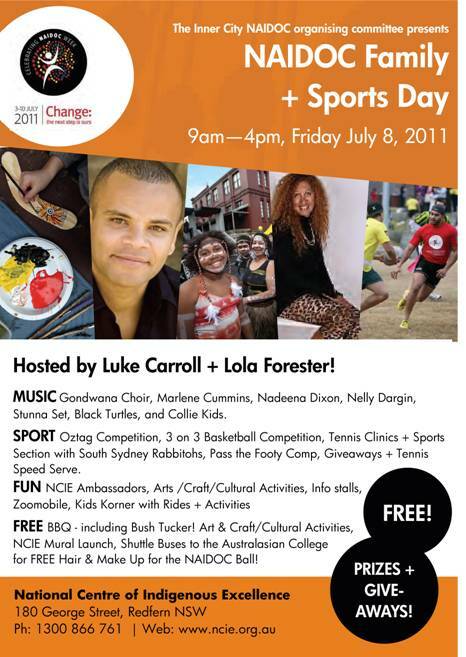 Inner Sydney Regional Council will be hosting the Our Future Community – The Challenge of Change conference on July 20th 2011. The conference will look at the challenges faced by the NGO sector as we move into the next decade. The event is to be held at Sydney Town Hall and will be facilitated by Helen Campbell OAM, with Eva Cox as the Keynote Speaker. 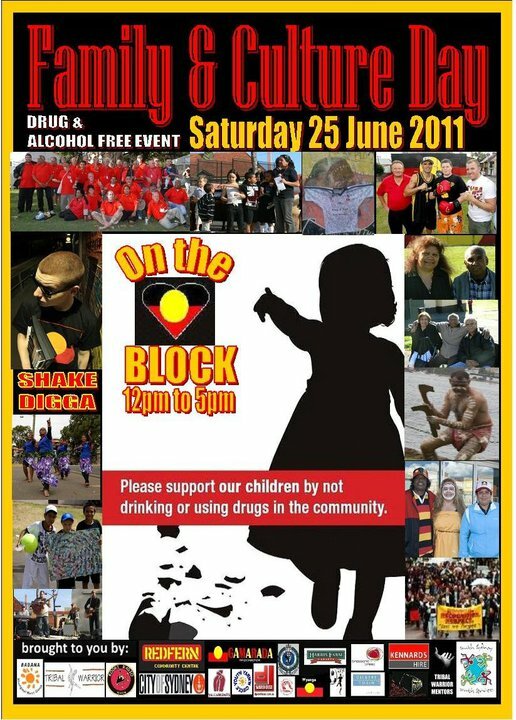 For more information, contact Char Jones on char.jones@innersydneyrcsd.org.au or call Inner Sydney Regional Council on 9698 7690. Australian Mobile phone numbers are going public next month. All mobile phone numbers are being released to telemarketing companies and you will start to receive sale calls. Depending on your provider and plan, you can be charged for these calls. The Australian Communications and Media Authority have a Do Not Call register. You can access the register at https://www.donotcall.gov.au. 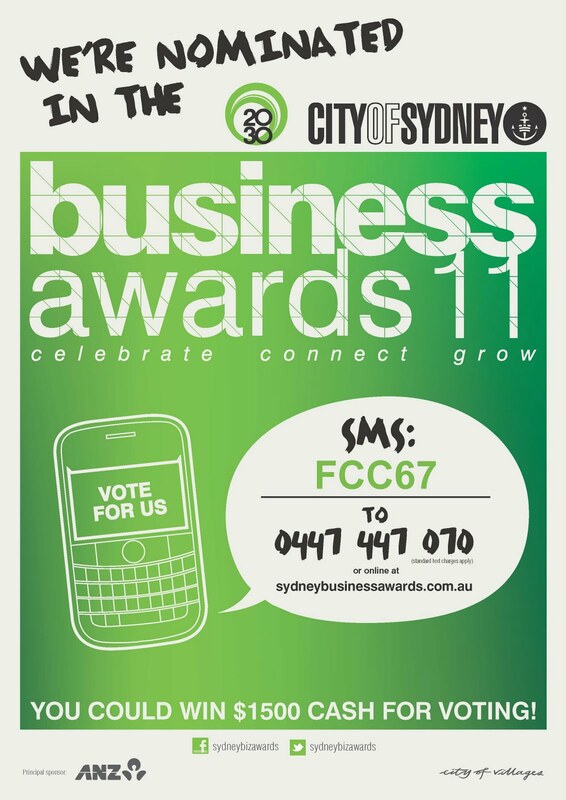 The link allows you to enter your phone numbers to put an end to telemarketing calls. Randwick City Council will be holding a free full day Playwriting and Performance Workshop on Saturday 2nd July from 10am to 4pm at Bowen Library and Community Centre, 669-376 Anzac Parade Maroubra. Apologies for multiple emails, just wanting to make sure I reach you all. Thank you for your July stories. Dorothy and I will be in touch about those in next week or so. We will publish a July SSH, with space for tributes to Trevor -- please send your special letters to the editor. We will not publish an August SSH -- we'll need that time to grieve properly and to make plans for the future. In recent months Trevor helped to compose a five-year plan for the paper, so we can be confident about the way forward, and know that he affirmed the plan. I have attached funeral details below. Thanks for all your kind words and support this week. In lieu of flowers the family requests donations to The South Sydney Herald. By mail: PO Box 3288 Redfern NSW 2016. By EFT: BSB 062 231; Account No. 1021 8391. "... love is everywhere present where there is one who loves" (S. Kierkegaard). It is with great sadness that I write to let you know that Trevor Davies passed away this morning Tuesday 14 June 2011. Trevor was due to undergo an angiogram today but was taken to hospital yesterday and had a massive heart attack there. Doctors worked on him for many hours but were unable to revive him. It only became apparent when they operated on him that he had a congenital hole in the heart and an infection. Trevor had only recently celebrated his 55th birthday. Trevor was a member and Elder of South Sydney Uniting Church, the founding editor of the South Sydney Herald and long-time Secretary of the Darlington ALP Branch. Trevor was one of the foundation members of REDWatch and was known to very many people within the local community. Please pass word on to those you know who knew Trevor. LIFESTYLE? GENES? WHAT REALLY CAUSES CANCER? Cancer Council NSW needs your help to find out what causes cancer. We are undertaking a landmark research initiative to assess the causes of cancer. The CLEAR Study has the potential to lead to cancer breakthroughs. You – or someone you know - can participate if you have been diagnosed with cancer for the first time within the past 18 months. We need 10,000 people by the end of 2011. 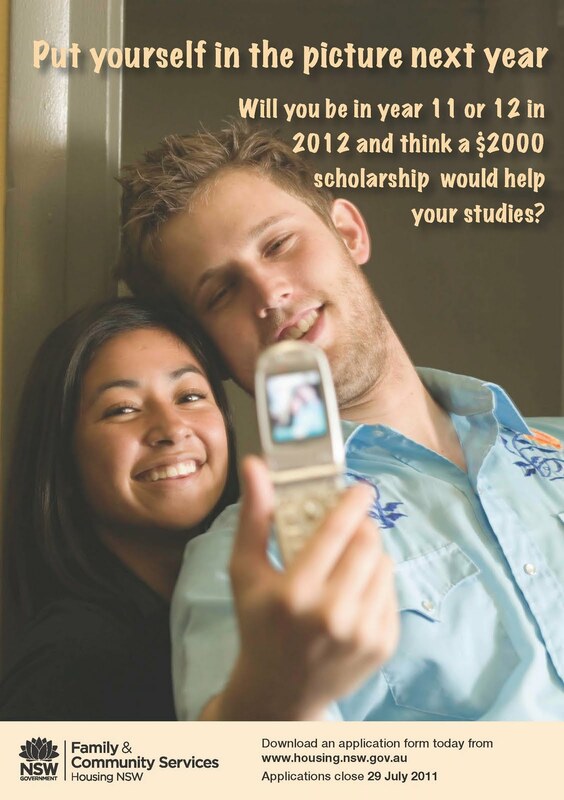 We are halfway there, but we need your help. Participation in the CLEAR study involves completing a questionnaire and providing a small blood sample (optional). Both are a one time only activity, and there are no further obligations. It’s that simple to help us find the answers.